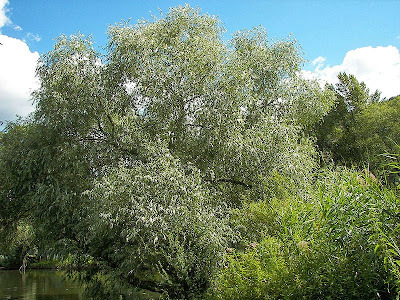 White willow Salix alba, photographed by Willow. Salix, the willows, is a genus of wind-pollinated trees and shrubs found mostly in arctic to temperate regions. Characters (from George W. Argus): Shrubs or trees, slightly heterophyllous, clonal or not, clones formed by root shoots, rhizomes, layering, or stem fragmentation; branching sympodial. Stems not spinose. Buds 1-scaled (rarely oily), margins connate into calyptra or distinct and overlapping adaxially, scale inner membranaceous layer usually not separating from outer layer, sometimes free and separating). Leaves deciduous or marcescent; stipules persistent, caducous, or absent (varying in presence and size on early and late leaves); petiole glandular-dotted or lobed distally; (blade often more than twice as long as wide, venation usually pinnate, margins entire, crenulate, crenate, serrate, serrulate, or spinulose-serrulate, teeth gland-tipped). Inflorescences axillary or subterminal, catkins, erect, spreading, or ± pendulous, sessile or terminating flowering branchlets, usually unbranched; floral bract apex entire, erose, bifid, or irregularly toothed; pistillate bract persistent or deciduous after flowering. Pedicels present or absent. Flowers: (sessile), perianth reduced to adaxial nectary (rarely also abaxial nectary, then distinct or connate into shallow cup); stamens 1, 2, or 3-10; filaments distinct or connate; ovary (stipitate or sessile), 2-carpellate; ovules (2-)4-24(-42) per ovary; styles usually connate, sometimes distinct distally; stigmas 2, entire or 2-lobed (less than 2 mm). Fruits capsular, (2-valved, obclavate to ovoid or ellipsoid). Seeds: aril present. x = 19. [BV06] Brack, V., Jr., & R. K. La Val. 2006. Diet of the gray myotis (Myotis grisescens): variability and consistency, opportunism, and selectivity. Journal of Mammalogy 87 (1): 7-18. [HL08] Henniger, M. & R. Leder. 2008. Eozäne Makroflora der Querfurter Mulde. Mauritiana 20 (2): 229-251. [K05] Kopelke, J.-P. 2005. The species of the Pontania proxima group in Europe (Hymenoptera, Tenthredinidae, Nematinae). Senckenbergiana Biologica 85 (1): 85-95. [K06] Kopelke, J.-P. 2006. Description of the female of Euura myrtilloides Kopelke 1996, with a key to the European species of the atra-group (Hymenoptera, Tenthredinidae, Nematinae). Senckenbergiana Biologica 86 (1): 75-84. [K07a] Kopelke, J.-P. 2007a. The European species of the genus Phyllocolpa, part I: the leucosticta-group (Insecta, Hymenoptera, Tenthredinidae, Nematinae). Senckenbergiana Biologica 87 (1): 75-109. [K07b] Kopelke, J.-P. 2007b. The European species of the genus Phyllocolpa, part II: the leucaspis-group (Insecta, Hymenoptera, Tenthredinidae, Nematinae). Senckenbergiana Biologica 87 (2): 149-161. [K07c] Kopelke, J.-P. 2007c. The European species of the genus Phyllocolpa, part III: the species-groups of crassispina, scotaspis, and piliserra (Insecta, Hymenoptera, Tenthredinidae, Nematinae). Senckenbergiana Biologica 87 (2): 163-183. [LO98] Lack, H. W., & H. Ohba. 1998. Die Xylothek des Chikusai Kato. Willdenowia 28: 263-276. [M83] Myers, R. L. 1983. Site susceptibility to invasion by the exotic tree Melaleuca quinquenervia in southern Florida. Journal of Applied Ecology 20: 645-658. [O88] Ohba, H. 1988. The alpine flora of the Nepal Himalayas: An introductory note. In The Himalayan Plants vol. 1 (H. Ohba & S. B. Malla, eds) The University Museum, University of Tokyo, Bulletin 31: 19-46. [R-CT01] Ragusa-di Chiara, S., & H. Tsolakis. 2001. Phytoseiid faunas of natural and agricultural ecosystems in Sicily. In Acarology: Proceedings of the 10th International Congress (R. B. Halliday, D. E. Walter, H. C. Proctor, R. A. Norton & M. J. Colloff, eds) pp. 522-529. CSIRO Publishing: Melbourne. [V09] Verdcourt, B. (ed.) 2009. Additions to the Wild Fauna and Flora of the Royal Botanic Gardens, Kew. XXVI. Miscellaneous records. Kew Bulletin 64 (1): 183-194.